Comment: The Lord says: “See, I am going to bring them from the land of the north, and gather them from the farthest parts of the earth.” All of God’s scattered people will be brought back together and they will sing and dance and celebrate with each other because of God’s goodness. 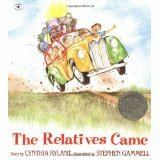 In The Relatives Came, a carload stuffed with relatives arrives from Virginia at the narrator’s home. Then the hugging, the meals, sharing bedrooms and making music together begins! The relatives stay for weeks, everyone happy to share and be with each other. Finally, the relatives have to go back to Virginia, but everyone thinks about next summer, when they will be gathered together again. God’s people, too, rejoice when they are gathered together to partake in God’s goodness, and any time we are separated, we dream about the time to come, when God will gather us together again. 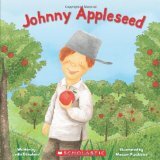 Comment: The story of Johnny Appleseed is based on a man named John Chapman who grew up in Massachusetts. He learned about apple orchards from his grandfather, and knew how to plant and tend apple trees. Eventually he traveled to the western United States, and along the way he planted apple seeds which grew into trees, bearing delicious apples for everyone to enjoy! In our passage, the Ephesians are told that in hearing the word of truth, they have been marked with the Holy Spirit’s seal, which will lead to inheriting God’s redemption. Just as the tiny apple seeds were a pledge toward the future, a pledge of new life and abundant harvest to come, so, too, the tiny seed of the gospel truth is a pledge of redemption for God’s people. Just like a seed, the gospel has been planted in our lives. And just like a seed will certainly blossom into a tree, in the Holy Spirit we are certainly sealed for God’s redemption. The promise of an apple tree is a promise we have, too—the inheritance we are promised in God is a guarantee. Comment: Jesus came into the world as the Word, and became flesh and lived among humankind. But even though Jesus came in the flesh to those who were his own, many still did not accept him. In Katie and the Puppy Next Door, Ruby, the puppy next door, comes to Katie’s house, and wants to play, share toys and food, and spend time with Katie. Even though they are both puppies, Katie doesn’t like this new puppy being in her house, playing with her things, hanging around her all the time. Eventually, though, Katie learns to share and accepts Ruby as a new friend. In a similar way, when Jesus came to earth in human flesh, many did not accept him, but others did accept him and they became part of his family as children of God. Jesus lived a life like we did, and redeemed our existence, so that we can live like him. He came to be with us, and live among us, and receiving his presence, we live as children of God. Lectionary Links: Sunday, January 4, 2015 by Storypath is licensed under a Creative Commons Attribution-NonCommercial 4.0 International License.